One of the most highly anticipated albums of recent years was Chvrches’ The Bones Of What You Believe, which was recently nominated for 2014s Scottish Album Of The Year Award. It’s just the latest chapter in the Chvrches’ story. Chvrches are no ordinary band. Far from it. They’ve come a long way in a short time. The story behind the rise and rise of Chvrches so truly remarkabld. It was three years ago, in 2011m, that Chvrches were founded in Glasgow. Since then, everything has happened so quickly for Lauren Mayberry, Ian Cook and Martin Doherty. They’ve spent the last three years touring the world converting people to their unique brand of shimmering electro-pop. Britain, Europe, Canada and America gave been conquered by Chvrches. Somehow, Chvrches have also found the time to release a four singles and a trio of E.Ps. These singles were a tantalising taste of the main event, Chvrches highly anticipated debut album The Bones Of What You Believe. This was the album that introduced the world to Scotland’s latest pop sensation, Chvrches. Chvrches, lead vocalist and keyboard player, Lauren Mayberry is an accidental pop star. Originally, she studied law and after graduating, studied journalism. With a Masters in journalism on her C.V. Lauren became an award-winning freelance journalist. From there, she almost inadvertently, became a musician. May 2012, saw Chvrches release their first single. They did this in an unusual way. Through the blog of the Neon Gold label, people were able to download a free copy of Lies, their debut single. This somewhat unorthodox release must have worked. Soon, people were talking about Chvrches. By now momentum was building. What helped, was that Chvrches were a great live band. Throughout the summer of 2012, were honing their live act. Quickly, word was spreading about this new Glasgow band. September 2012 it seemed, was the right time to release their sophomore single. Looking at Chvrches achievements so far, I’d suggest that they’ve surpassed everything they achieved during 2012. They’ve released two single and two E.P.s. July 2013 saw Chvrches released their fourth single Gun. Just like Recover, Gun was available as either a single or an E.P. Gun gave Chvrches the biggest single of their nascent career. Not only did it reach number fifty-five in the UK, but number forty-four in Japan. It seemed that with each single, Chvrches were conquering another part of the world. Britain first, then Europe, Canada, America and now Japan are all devotees of Chvrches. Recently, on a coast to coast tour of America, Churches have been winning friends and influencing American musical lovers. This is perfect timing. After all, Chvrches’ debut album The Bones Of What You Believe, was due for release. Written by the three members of Chvrches, The Bones Of What You Believe is without doubt, one of the most eagerly awaited and anticipated albums of recent years. It’s bound to reach the upper reaches of the charts on both sides of the Atlantic. I’ll tell you why, after I’ve told you about The Bones Of What You Believe. Opening The Bones Of What You Believe is one of the singles that introduced Chvrches to the world, The Mother We Share. Washes of synths give way to squelchy synths and crisp drums. Taking centre-stage is Lauren Mayberry’s ethereal vocal. It’s emotive and heartfelt, as harmonies and synths reverberate into the distance. Drums crack, synths beep and squeak and drums signal Lauren’s about to take this anthemic track to its crescendo. We Sink’s roots are in eighties synth pop, Euro Disco and house. The arrangement’s driven along by synths while pounding drums provide the pulsating backdrop to Lauren’s feisty vocal. Harmonies and synth strings sweep in as Lauren comes across as part diva, part ice-maiden. She struts her way through the track. During a breakdown the song takes on a dreamy, lysergic sound. Then normal service is resumed, as this classy slice of dance music heads to a close. From the opening bars of Gun, my faith in modern music is restored. It’s a reminder of what a classic pop song sounds like. Stabs of keyboards are joined by shimmering, synths. They provide the backdrop to the ethereal beauty of Lauren’s emotive vocal. Accompanying her heartfelt vocal are rolls of drums, breathy harmonies and washes of crystalline synths. As for the back synth and drums they add duel bursts of drama. Their raison d’etre is to reinforce the drama and emotion in Lauren’s vocal. Dance-floor friendly, Gun is full of sweet poppy hooks and moments of drama and emotion. Tether sees Chvrches drop the tempo, and increase the drama. Guitars riff dramatically, while Lauren’s vocal is variously tender, thoughtful and laden with drama. Briefly, galloping drums drive the arrangement along. This proves effective, adding to the drama. As for Lauren’s vocal, it’s full of emotion and hurt. She breathes life and meaning into the lyrics with a soulful, soul searching vocal. After a dramatic pause, swathes of swirling strings and banks of synths take the track in the direction of the dance-floor. Fusing elements of eighties synth pop, Euro Disco, Hi-NGR and soul, we hear two very different sides of Chvrches within a five majestic minutes of mesmeric music. Thunderous drums and beeping, squeaking synths open Lies. They provide the backdrop for Lauren’s sassy, feisty vocal. Behind her, Ian Cook and Martin Doherty unleash banks of keyboards and synths, while drums provide a dramatic, electro heartbeat. Add to this Lauren’s ethereal, multi-tracked backing vocals. They provide a contrast to the dark, dramatic arrangement. It takes on a life of its own. It’s becomes a collosus. As it marches, struts and swaggers along, Lauren’s vocal is full of bravado, feisty and oozes sass. Under The Tide sees Lauren take a rest from vocal duties. This allows the Chvrches to take a different approach on what’s another dance-floor anthem. House, synth pop and electro are the main influences here. Stabs of jagged synths and a hypnotic, pounding drum combine with an urgent vocal. Bursts of a bass synth and cascading keyboards provide accompany the impassioned, encouraging vocal. Then adding the finishing touch, are sweeping, ethereal and joyous singalong harmonies enter. The result is an infectiously catchy, hands in the air anthem from Chvrches. Lauren returns on Recover. She delivers an urgent, dramatic vocal. Her vocal is delivered in short, sharp bursts. As for the arrangement, there’s a Kraftwerk influence in the keyboards and synths. The drums veer between slow and spacious, to crisp, urgent, bursts. Later, when the track slows down, it takes on a mysterious sound. Spurred on, Lauren delivers a vocal that’s not just heartfelt and hopeful, but ethereal, emotive and enigmatic. Night Sky is a light, airy track that breezes along. Built around sparkling synth lines that are repeated throughout the track, plus pounding drums that provide the heartbeat. Lauren’s vocal is dreamy and wistful. That’s before things change. All of a sudden, Chvrches kick loose. After harmonies cascade, the arrangement explodes. Chvrches reveal a rocky side and Lauren briefly, finds her inner rock chick. Then she returns to the mysterious, melancholy and ethereal beauty of earlier. Flitting between the two sides of the track, Lauren and the rest of Chvrches reveal their versatility, fusing seamlessly, musical genres. Science/Visions has a broody, moody and mysterious sound. A haunting sound gives way to a combination of cascading, dramatic synths and thunderous drums. Lauren’s vocal is tender and fragile. Elfin like, its almost dominated by the rest of the arrangement. The arrangement becomes an unstoppable musical juggernaut. Filters are used on the arrangement, while echo and delay are used on Lauren’s vocal and the punchy harmonies. All this gives the track a real deep house sound. Having said that, not may producers can make music as good as this. After drums pound, Lungs takes on a sci-fi sound. That’s thanks to the synths and effects. Lauren’s sweet vocal is urgent and earnest. Synths buzz, drums pound and a whole manner of futuristic sounds give the track an innovative, inventive 21st Century sound. Full of drama and slick poppy hooks, this is Chvrches at their best. Definite stabs of synths and Lauren’s dreamy, wistful vocal opens By The Throat. Tender harmonies are added as what sounds like a laid back slice of mellow electro pop unfolds. That’s not quite the case, Gradually, the drama builds and grows as what sounds like dance-floor friendly track threatens to explode. It doesn’t. Chvrches are toying with you. Sitting midway between the two, Chvrches tease and tantalize you with this delicious, enigmatic, shimmering slice of electro pop. You Caught The Lights closes The Bones Of What You Believe. It’s another enigmatic track. You wonder the direction it’s heading in. The tempo is slow, with drums loud and proud providing the heartbeat. Washes of synths sparkle across the arrangement as a worldweary male vocal full of emotion delivers a heartbreaking vocal. Drums, chiming guitars and synths provide a dramatic accompaniment, as the track heads in the direction of indie rock, whilst borrowing from synth pop. Harmonies, searing guitars, ponderous drums and washes of synths play their part in this dramatic, melancholy tale of heartbreak. 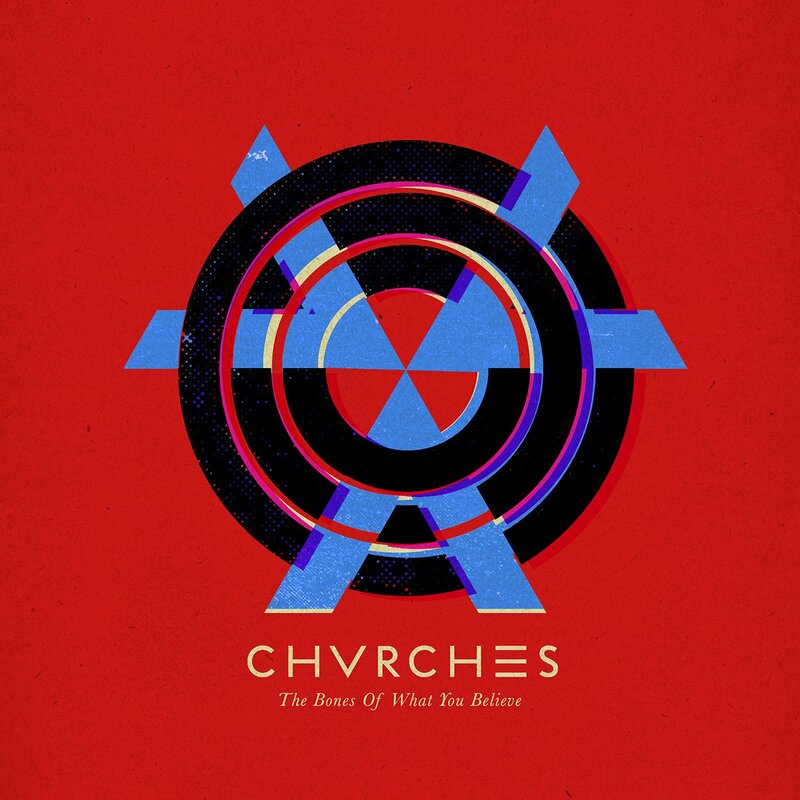 Released on 23rd Speptember 2013, The Bones Of What You Believe is a tantalizing taste of what Chvrches are capable of. One of the most highly anticipated albums of recent years, The Bones Of What You Believe, not only lived up to expectations, but surpassed them. The Bones Of What You Believe features innovative, inventive music. It’s pioneering electro-pop, full of shimmering synths and the ethereal beauty of Lauren Mayberry’s vocal. Her vocal is reminiscent of Liz Fraser of The Cocteau Twins. Along with Ian Cook and Martin Doherty, Chvrches fuse electro pop, house, synth pop, hi-NRG, Euro Disco, pop, indie rock and soul. Dance-floor friendly, anthemic, soulful and full of slick poppy hooks, The Bones Of What You Believe is pop perfection. That’s why Chvrches will be Scotland’s next big musical export. Many have been contenders for the title, now it looks like Chvrches with their unique sound, will claim it as their own. Chvrches have restored my faith in modern music. I’m pleased that still, there are a group capable of making the perfect pop song. That’s what The Bones Of What You Believe is. It’s a reminder of what a classic pop song sounds like. For everyone who says pop music is dead, play them The Bones Of What You Believe. That’ll prove them wrong. Pop music is alive and kicking, and Chvrches’ debut album The Bones Of What You Believe is the future and salvation of pop music. That’s why Chvrches’ must be a favourite to win the 2014 Scottish Album Of The Year Award withThe Bones Of What You Believe, their unique brand of hook-laden, perfect pop. ← BARBARA MASON-LOVE’S THE THING.